Olive Garden team members from Houston, Texas, prepare food to be donated. 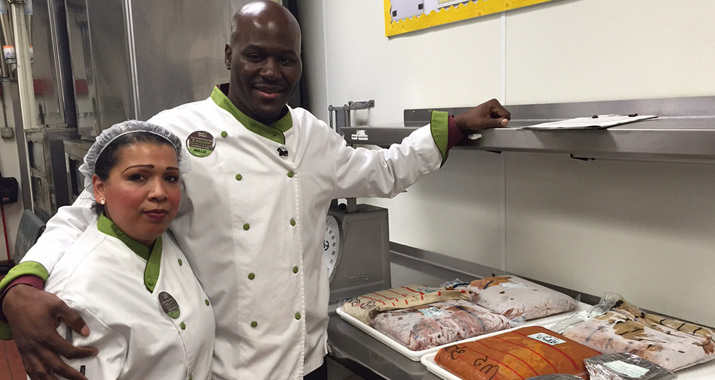 As a restaurant company, Darden cannot ignore the reality that millions of people need food. Nearly 50 million Americans — including 16 million children — are at risk of hunger, and not just today on Hunger Action Day. Darden team members are helping to reduce these numbers through our Darden Harvest program. At each one of our 1,500 restaurants, we “harvest” surplus fresh, wholesome food that is not served to our restaurant guests and safely prepare it for donation to hundreds of food banks and shelters across the country. Since Darden Harvest began in 2003, we have donated more than 91 million pounds of food. And if that wasn’t enough, a culinary team member at the LongHorn Steakhouse restaurant in Beavercreek, OH, takes Darden’s commitment to alleviating hunger even further. Joe Murphy, an 11-year team member, took a hard look last year at the surplus food his LongHorn Steakhouse restaurant sets aside for donation each week and decided to turn it into heat-and-serve family meals for those dealing with hunger in his community. Right now, Joe is on a barbecue kick. “I prepare a regular barbecue and a spicy version. I’ll doctor it up so it doesn’t taste the same each time.” He prepares one or two batches of meals a week so he can “efficiently use the product and get the meals into the freezer,” with three batches a week in the busy time between Thanksgiving and Christmas. “It works out great to be able to donate more food over the holidays,” he said. “I prepare food all the time, so it’s really nothing for me,” Joe said of the four hours he spends each week creating his masterpieces to serve the hungry. “I take a little bit of my day to do something big.” His culinary efforts add up to at least 1,200 pounds of food donations a month. The meals are picked up and distributed by Gospel Mission in Dayton. No one can end hunger alone — not Darden, not Joe and other team members like him, not food banks, not our mission partner Feeding America, which designated September as Hunger Action Month. But each of us can do something little in the hope it will add up to something big.